There was a time when group fitness intimidated the hell out of me. The giant mirror alone terrified me. “If I can see myself in this giant mirror, that means all these other people can see me too.” The gym in general terrified me. I thought more than once that “I needed to get into shape before going to the gym.” Oh by the way, I am also terrified of public speaking. 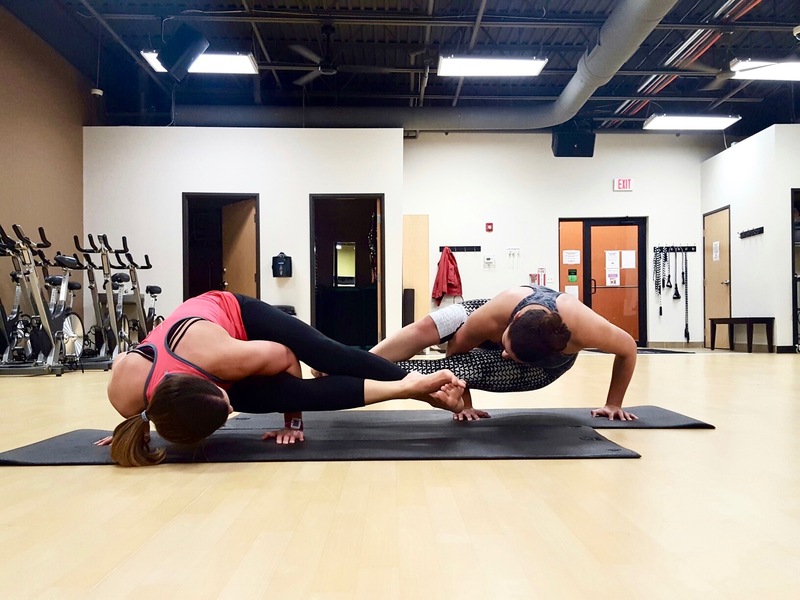 You may ask, “So you are scared of public speaking, the gym, and group fitness classes, yet you are a group fitness instructor?” Yes, but when I began to consider becoming a group fitness instructor I had already overcome my fear of gyms and group fitness classes. However, this was not an overnight process. When I was young I would go to classes with my mother or run around the track at local family fitness centers. I have never been athletic and I have always been incredibly self-conscious so it wasn’t my idea of fun. Once I started college, every once in a while I might go to the university recreation center but a regular exerciser, I was not. After graduation I started going to a women’s bootcamp with my mom. The first day I drove into the parking lot I found myself very angry with my mother as she had failed to mention that this bootcamp was outside in a wide open field across the street from a popular restaurant. The instructor and owner of the bootcamp was very knowledgeable and motivating. He opened my eyes to my deficiencies and my abilities. He did not go easy on us so I did not have the time or energy to worry about what those people inside the restaurant might be thinking as I jumped up and down in front of them. Eventually, I started working out with my mom and Pam (fellow bootcamper and my mother’s friend who became one of my adoptive mothers) at the university recreation center. The anxiety I felt in that open field did not even compare to the anxiety I felt walking into a university gym full of blonde, skinny girls (side note: I am not blonde or naturally skinny). Standing outside of the mirror-lined studio waiting for the instructor to unlock the doors would cause my heart to race and sweat to bead up on my forehead (because I was nervous). Once I actually entered the room I quickly realized three things: 1.) You can’t read people’s minds so even if you think someone has just glanced over at you and generated some negative thought about you inside of their brain, you will never know, 2.) Once the music starts and the instructor starts yelling instructions, no one has time to look at you, and 3.) Choosing to avoid doing something beneficial for yourself because you fear that someone might possibly think you’re fat or ugly or old or uncoordinated is not beneficial. You have to understand that me having these three realizations was a huge deal. I allowed the fear of other people’s potential opinions of me dictate my life for years. Allowing myself to do things to better myself led to me actually bettering myself which led to me feeling better about myself. Group fitness classes helped me get over my fear of the gym, which eventually led me to the big open area of cardio machines and shortly after the weight room where all those guys hangout. Later on, I got a personal trainer. I quickly saw more muscle tone. The stronger I got the more creative my trainer had to become, thinking of new things for me to do or new ways to make the same old things more difficult. I quickly learned that even though I was not athletic I was good at exercising. I found out that my gym membership included group fitness classes and they offered Barre. I forgot to mention that I took dance for ten years (20 years ago) and loved the idea of an exercise program based in ballet principles. After the third class, the instructor looked at me and said, “You’re better at this than me, you should get certified and teach it.” I was in shock, someone thought I was good at something and of all the things in the world it was exercising. I kept going to classes (Barre, Yoga, and Tabata) and a few months later I attended certification classes. To graduate the certification program I was going to have to create a routine and teach it to the other students. There were only four other people there but I was terrified. Like public speaking, thinking off the top of my head is not a skill that comes naturally to me which is probably why public speaking is so scary. The night before I prepared my music, chose my exercises, wrote out a script, and practiced it over and over. I hopped in my car the next morning and immediately started shaking, dreading what I was going to have to do in a few hours. I thought I was going to die. I started my music and walked to the front of the room. Shaking, I started reciting my lines (scripted instructions, reminders, and motivations) and then it was over, I had survived and succeeded. It is okay to be nervous. I still get nervous when I sub for another instructor or begin teaching a new class but it is nothing like it once was. It look me over a year to even attempt to teach a class with out my color-coded routine, outlining each exercise and action. Though I still use my printed routines, my improvisation skills have greatly improved. Every non-choreographed class is an experiment. You never know if an exercise is going to be well received until you try it. It is okay if something does not work, just move on to the next exercise. It is also okay if you mess up. We are all human. Just avoid dwelling on it and do not let that one mistake ruin your mood for the rest of class. You need proper attire. Sometimes it is difficult to predict how an article of clothing is going to perform till halfway through class. I now know exactly what kind of tops and capris I need depending on the class but there were a few failures along the way. Sometimes the downward facing dog in the dressing test is not completely accurate. Remember, if you are going to bend over in front of someone, make sure those pants you are wearing are not see-through. Just for reference, the Athleta Stealth Capri provide compression, do not budge, and are not see through. I have three pairs. Here is a good fitted t-shirt that stays put for Yoga class. I love this Lululemon What The Sport Tee for Tabata and Barre. Sometimes you can find them at Lululemon outlet stores. That is where I have purchased all three of mine. Not everyone is going to like you. All participants are different and all instructors are different. Some people are not going to like your class. Do not focus on the participants that don’t show, focus on the ones who do. Modifications are required. I repeat all participants are different. They cannot all put their leg behind their ear. If you are teaching an all levels class and there is no way to modify an exercise or provide another option, avoid it. Get to class at least ten minutes early. You should be there to greet participants and tell them what equipment they need. The first ten minutes of class should not be spent setting up for the class. Also, avoid rushing out. Your time is not any more valuable than the time of participants. If you have to leave by a certain time, tell your participants during the warm-up, but if you can, avoid running out the door right when class ends. Do not take suggestions or criticism personally. If participants do not like something, ask them why and if it is a valid complaint, change what you’re doing. There will always be one person you can never please so majority vote wins here. If that one person is the only one complaining, be as respectful as possible and they will either get over it or move on. Leave your bad attitude at home. A year ago I might have said your personal life in general instead of attitude, but if you’re like me, some of your participants may have become some of your best friends (and adoptive mothers and fathers). You get comfortable with your regulars and share information (good and bad). Just avoid taking your personal frustrations out on them. If you are in a bad mood, don’t bring into that studio. It is a gym not a fast food restaurant at two in the morning. Your participants want a happy, motivated, approachable instructor not a recap of your horrible day. Take your time. No need to rush through your routine. Going too quickly may give participants the impression that you are more interested in quantity over quality. Make sure everyone knows that they need to go their own pace, listen to their body, watch their form, and if you are in the appropriate setting, correct and adjust mistakes. However, try to avoid embarrassing people and ask before class if anyone doesn’t want to be adjusted (some people do not want you touching them). Safety first. Not everyone is going to move like you want them to and if saying and showing them isn’t working, as long as they are not hurting themselves or others, there is nothing you can really do about. Every participant is different. You need to challenge people but remember everyone’s challenge is different. Be tough but kind. Remember why you are there. You are there to provide instruction, motivation, and help people reach their goals. Lighten up. We have the best time in class. I have some incredibly funny and motivated participants. We joke and laugh all through class but we still get an effective workout. Everyone counts. Even if only one person shows up for class, you’re still there to teach it. Sending them on their way makes it seem like they do not matter. If you’re both already there, teach the class. Attend other people’s group fitness classes. Supporting your fellow group fitness instructors is not only helpful for them but it is helpful for you. You can learn so much from watching other people teach. You may pick up a few tricks, exercises, and maybe make a few friends.